Project Management Professional (PMP) is an internationally recognized professional designation offered by the Project Management Institute (PMI). As of March 2018, there are 833,025 active PMP certified individuals and 286 chartered chapters across 210 countries and territories worldwide. The exam is based on the PMI Project Management Body of Knowledge. The exam consists of 200 multiple choice questions written against the PMBOK specification and the PMP Code of Ethics. The exam is closed book; no reference materials are allowed. Twenty-five of the 200 questions on the exam are "sample" questions used to fine-tune the degree of difficulty and precision of the exam and as such are not counted for or against a test taker. These questions are placed randomly throughout the exam. The test taker is only graded on their proficiency on 175 questions. The numbers in parentheses describe the percentage of questions for each domain. Each exam item (a question with its possible answers) has at least two references to standard books or other sources of project management. Most of the questions reference the PMI A Guide to the Project Management Body of Knowledge (aka the PMBOK Guide).The PMBOK Guide is currently (2018) in its sixth edition, and the PMP exam changed in March 2018 to align with the updated guide. encompassing a total of 49 processes. The processes of these knowledge areas are described by their inputs, tools and techniques, and outputs. The PMBOK also emphasizes the interaction and interdependence between different process groups. For example, the outputs from one process may be used by one or more other processes as inputs. Government, commercial and other organizations employ PMP certified project managers in an attempt to improve the success rate of projects in all areas of knowledge, by applying a standardized and evolving set of project management principles as contained in PMI's PMBOK Guide. In December 2005, the PMP credential was number 7 of ZDNet’s 10 best IT certifications. In 2012 the PMP credential was ranked as a top certification by CIO. In 2015, the PMP credential was ranked as the #4 certification by Global Knowledge, behind 3 Security certifications. 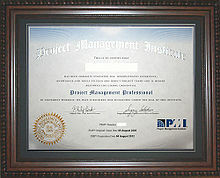 An example of a PMP Certificate issued by the PMI to candidates who pass the Project Management Professional Exam. The global network of Prometric testing centers provides the PMP exam as a computer-based test. They also offer a paper-based option for locations with no nearby Prometric testing centers. The exam consists of 200 questions ("items"). 25 are pre-release items, which are not included in exam scoring. Prometric calculates the score based on the other 175 items. Each multiple-choice item has one correct answer and three incorrect answers. Candidates who take the computer-based test receive their results (passed or not passed) immediately upon completion. PMI also evaluates proficiency levels in each project management process group in 4 levels. Above Target, Target, Below Target, and Needs Improvement. Examiners provide these results to the candidate on a score report after the examination. Candidates who take paper-based tests receive their test results and score reports typically within 4 weeks. Item writing is an ongoing process at PMI, and they periodically add new four-choice questions (items) and remove others. Item writers use the PMP Examination Specification to identify item contents and references (project management texts or standards) to verify correctness. Individuals who are active in the field of PMP exam preparation (trainers, courseware developers, book authors, etc..) may not participate in item writing. Continuous credential requirements are also called CCRs. To maintain the PMP qualification, 60 professional development units (PDUs) must be earned over a three-year cycle, from activities such as researching, authoring articles, speaking on project management-related topics, or being engaged full-time in project management. Credential holders may earn PDUs towards the maintenance of their credential through formal academic courses or courses offered by a provider (R.E.P. or Component). However, these are only two of the five categories of PDU earning opportunities in which a credential holder may participate. Effective 1 December 2015, CCRs will be updated to align with the employer-identified skills depicted in the PMI Talent Triangle, a combination of technical, leadership, and strategic and business management expertise, to ensure credential holders are equipped with skills relevant in a continually changing business environment. PRINCE2 could be seen as a competitor of Project Management Professional (PMP). In general, the USA and American countries prefer PMP, and UK, Australia and Europe prefer PRINCE2. Asia, Africa and the Middle East area have no strong preference for PMP or PRINCE2. PRINCE2 and PMP acknowledge each other's existence in their advertising material and attempt to position themselves as complementary products – PRINCE2 as a "methodology" and PMP as a "standard" – which can be used alongside each other. In practice, companies and practitioners choose one system or both due to the project environment, their geographical location and costs involved. ^ "Certifications". Project Management Institute. Retrieved 15 February 2019. ^ "PMI Fact File". PMI Today. Project Management Institute: 4. March 2018. Retrieved 1 March 2018. ^ Project Management Professional (PMP) Examination Specification. Project Management Institute. September 2005. ISBN 978-1-930699-88-5. ^ a b c "Project Management Professional (PMP) ® Handbook" (PDF). Project Management Institute. Retrieved September 18, 2009. ^ "Episode 52- The PMP Exam: 6th Edition Changes, What to Expect, and Tips to Pass - PMP Certification Exam Prep & Training - Velociteach". PMP Certification Exam Prep & Training - Velociteach. 2018-02-20. Retrieved 2018-06-11. ^ Dignan, Larry (December 11, 2008). "The 10 best IT certifications". Retrieved September 18, 2009. ^ Hein, Rich (August 2012). "12 IT Certifications That Deliver Career Advancement". ^ Hales, John. "15 Top-Paying Certifications for 2015". ^ Kokcharov, Igor (October 2014). "Project Manager's common Pitfalls / STS Research Report 2014". ^ "Maintain Your Credential". Project Management Institute. Archived from the original on July 7, 2009. Retrieved September 18, 2009. ^ "Maintain your Credentials". PMI.org. Project Management Institute. Archived from the original on 24 June 2014. Retrieved 4 July 2014. ^ "Continuing Certification Requirements (CCR) Program Updates". PMI.org. Project Management Institute. Retrieved 1 May 2015. ^ "Certifications". Project Management Institute. Retrieved July 9, 2014. ^ "PRINCE2 vs PMP Certification 8 Important Differences". www.educba.com. Retrieved 7 December 2017. This page was last edited on 13 March 2019, at 13:09 (UTC).